The Museum of International Folk Art Museum in Santa Fe, New Mexico has an exhibit entitled "Plain Geometry: Amish Quilts". While I'm certain the Amish would not favor the comparison, I observed some astounding similarities between today's modern quilting movement and the Amish quilts in the exhibit. 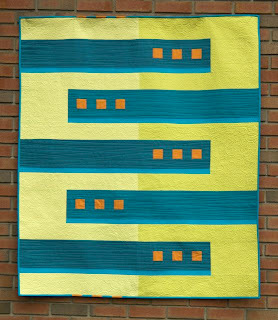 The Modern Quilting Guild defines modern quilts as, "primarily functional." 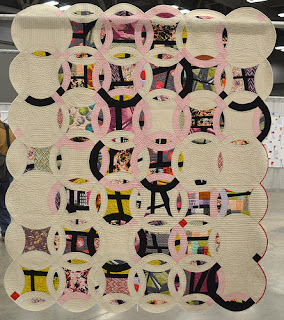 Likewise, the, "aesthetic sense of Amish Quilters exemplifies the values of simplicity and functionality," as stated in the exhibit explanation. 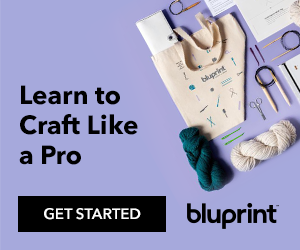 MQG states that modern quilts often feature, "the use of bold colors and prints, high contrast and graphic areas of solid color, improvisational piecing, minimalism, expansive negative space, and alternate grid work." 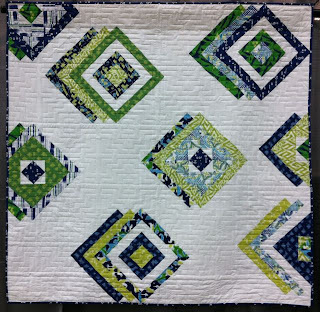 The updating of classic quilt designs is referred to as modern traditionalism. Look for the Diamond in a Square in the quilt below. 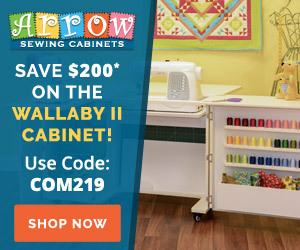 This is common in Amish quilts too. 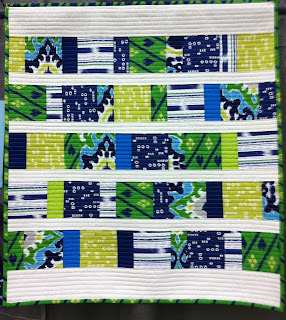 Bars are also a common feature within modern quilts. The Amish also favor them. 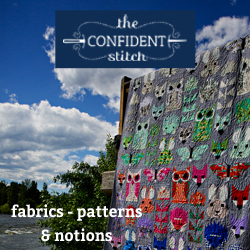 While thousands of modern quilters have joined in on the Scrappy Trip Along. 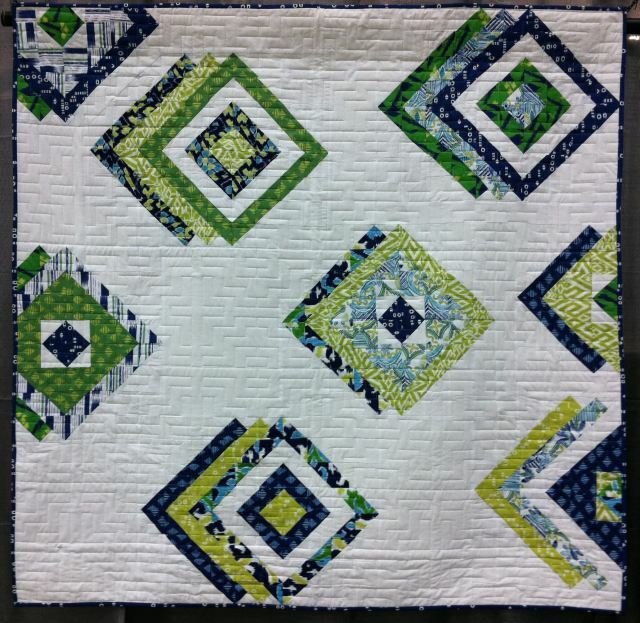 However, the Amish were creating their own scrappy Trip Around the World quilts, such as the one pictured below, long before anyone starting hashtagging anything on Instagram. 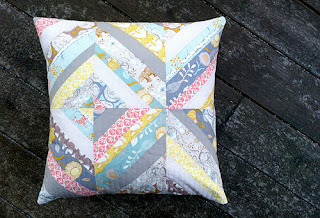 Improvisation string piecing is all the rage amongst modern quilters. 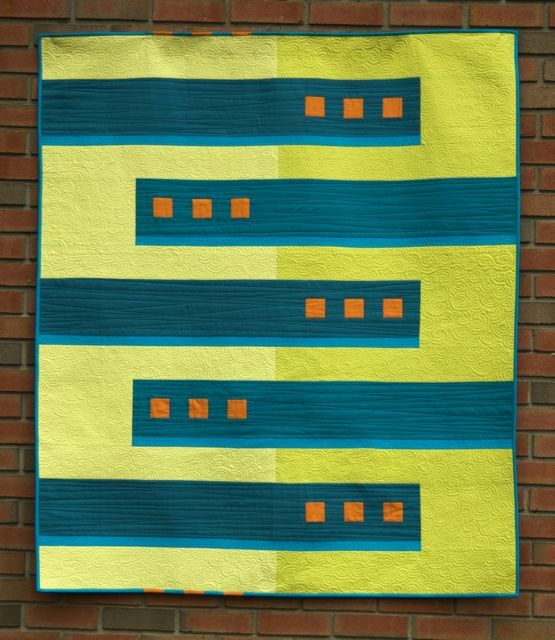 This 1945 Amish quilt from Missouri features improvisational strip piecing of solid fabrics. 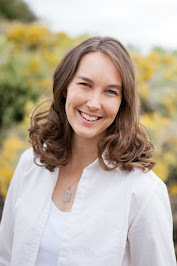 Try the technique yourself at Bonnie Hunter's website. Many modern quilters have embraced English paper-pieced hexagons. Apparently, the Amish did too. This Honeycomb quilt was created in 1925 in Holmes County, Ohio. 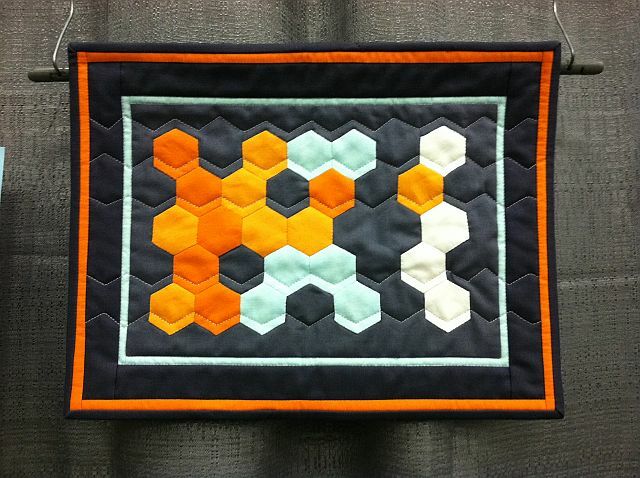 Bowties and Hexagons, a 1932 Amish quilt from Pennsylvania, mimics modernism in its use of bold colors, high contrast, and graphic areas of solid color. 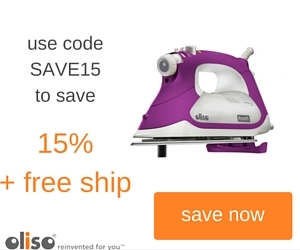 It is minimalistic in its use of a single block to create an overall design via color-shift. Expansive negative space is created due to the convergence of dark blue and black fabrics used as the background for the bowties. While modern quilters are piecing away with Ann Kelle's chevrons printed by Robert Kaufman, the love of chevrons was not lost on the Amish. Check out this 1885 Amish log cabin quilt! 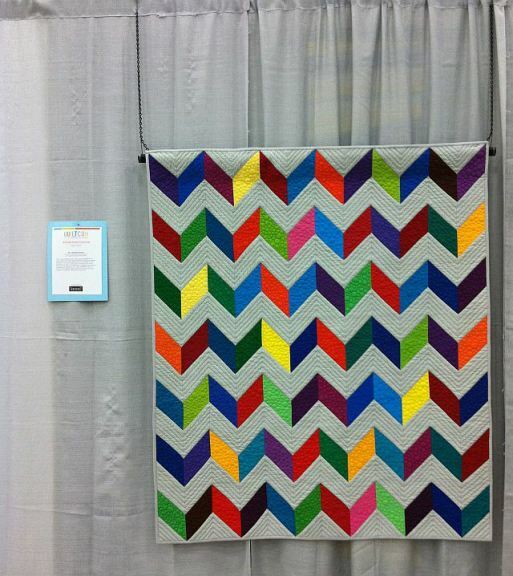 Use this quilt from QuiltCon as a point of comparison. Variations on the traditional log cabin are also a similarity between modern and Amish quilters. 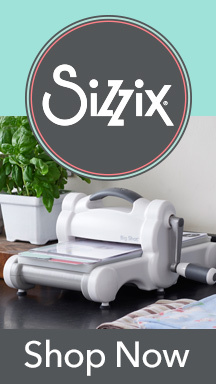 Gray is the neutral color of choice for many modern quilters. There's no denying the Amish creator of this 1885 log cabin felt the same way. A beautiful example of modern traditionalism is Double Edged Love by Victoria Findley Wolfe. This 1940 double wedding ring from Indiana exemplifies an Amish adaptation of the traditional design as well. 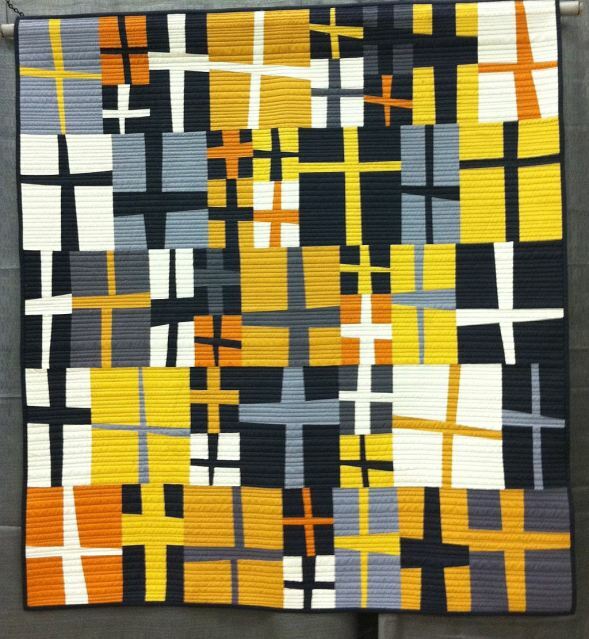 To round things out, here's some modern crosses from QuiltCon. 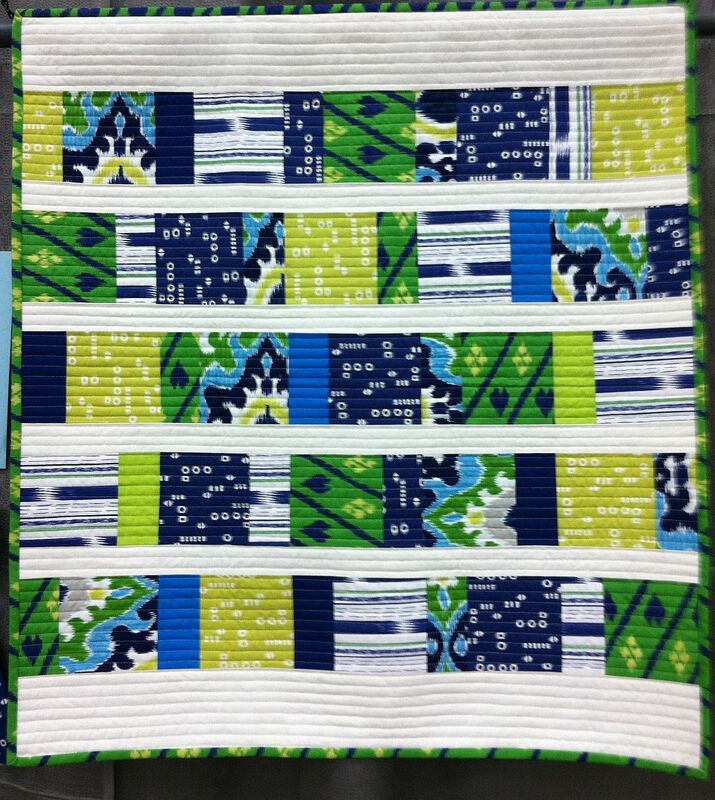 This quilt called Kelsey's Crosses was made by the Kansas City, Missouri Modern Quilt Guild and won 2nd Place in the Group or Bee Quilt category. Here's an Amish version of crosses.